Today SPEED announced that it’s giving away the most significant sweepstakes prize in Hagerty Fantasy Bid history – a one-of-a-kind Ford Racing Champions Shelby GT500 Special Edition Mustang. It’s set to be awarded as part of the networks nearly 40 hours of live coverage from the Barrett-Jackson Collector Car Scottsdale (Ariz.) Auction, which starts Jan. 17 at 7 p.m. ET/4 p.m. PT. The game and sweepstakes officially begin Jan. 19 at 7 p.m. ET/4 p.m. PT, and are among the many interactive opportunities available throughout the multi-day broadcast. Back in 2005, 66,800 total fantasy bids were tallied in that initial game. Last season, nearly 700,000 (699,200) fantasy bids represented a high-water mark of participation in the series of record-setting, year-over-year growth numbers that first exploded in 2009. Entering the Mustang sweepstakes is easy, anytime a contestant makes a fantasy bid during the Hagerty Fantasy Bid Game (sign-up details below), they are automatically entered into the drawing. This is a special Mustang by any standard, as 2011 Daytona 500 champion Trevor Bayne and 2011 NASCAR Nationwide Series Champion Ricky Stenhouse, Jr. were among those who collaborated on the build – an autographed plaque signifies their involvement. A Ford Racing Supercharger kit boosts an already robust factory installed 5.4-liter V8 engine from 550 to 750 horsepower, and a six-speed manual transmission delivers the power smoothly to the rear wheels. A new intense-environment C&R Racing cooling system, a 3.5-inch aluminum drive shaft; various exterior aero and appearance upgrades also focus an overall appeal. Ford’s Special Vehicle Team (SVT) also added its high-performance handling pack that includes Dynamic Suspensions front-and-rear adjustable shocks, lowering springs – dropping the overall ride height by 1.25 inches – and front-rear stabilizer bars. The extra power required an upgraded Wilwood brakes package featuring 14-inch drilled, slotted rotors and six-piston forged billet calipers on the front, and 12-inch rotors and four-piston forged billet calipers at the rear. 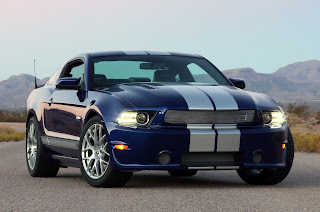 This entry was written by by MustangsDaily (Mustangs Daily) and posted here on Tuesday, January 3rd, 2012 at 5:07 pm and is filed under barrett-jackson, GT500, hagerty fantasy bid, News, shelby, shelby gt500, speed tv. This article was not written by us, rather gathered using RSS feeds listed here. We take no credit for this article. You can leave a response, or trackback from your own site.